A Letter No. 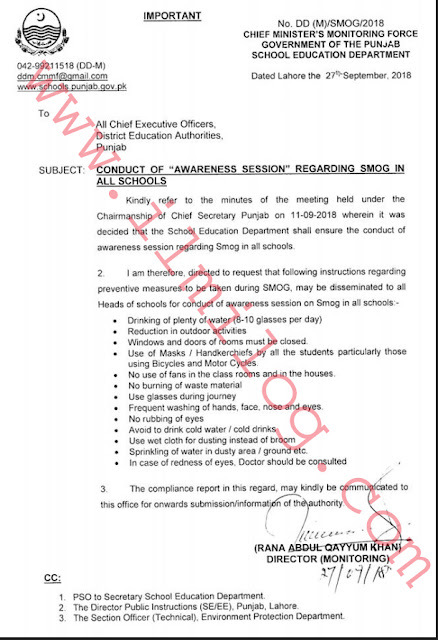 DO (M)/SMOG/2018 to all Chief Executive Officer, District Education Authorities, Punjab for Smog Check School Education Department on 27-09-2018. Kindly refer to the minutes of the meeting held under the Chairmanship of Chief Secretary Punjab on 11-09-2018 wherein it was decided that the School Education Department shall ensure the conduct of awareness session regarding Smog in all schools. • Plenty of water drinking 8-10 glasses per day • Outdoor activities reduction • Doors and Windows of rooms must be closed. • Use of Masks / Handkerchiefs by all the students particularly those using Bicycles and Motor Cycles. • No use of fans in the classrooms and in the houses. • No burning of waste material • Use glasses during journey • Frequent washing of hands, nose, and eyes. • No rubbing of eyes • Avoids drinking cold water / cold drinks • Use wet cloth for dusting instead of broom • Sprinkling of water in dusty area/ground etc. • In case of redness of eyes. The doctor should be consulted 3. The compliance report in this regard may kindly be communicated to this office for onwards submission/information of the authority. 1. 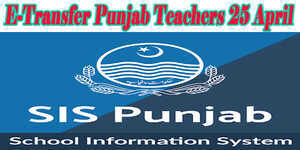 PSO to Secretary School Education Department. 2. The Director Public Instructions (SE/EE), Punjab, Lahore. 3. The Section Officer (Technical), Environment Protection Department.